I was just in Mass for the military police top shot competition came in 4th and last year 8th. Originally from Worcester and Northboro Mass. But after getting hurt in the Army we moved to Florida and don't miss the cold weather. I will be coming in next August may stop by to say hi. Won't drive the vette up since gas is shooting up. I do remember driving my 66 STINGRAY up one time and that was a hard ride. I wanted to let you know she's here and she's beautiful! Thanks for helping me attain my new 50th Anniversary convertible! Hey, I talked to Dan after he picked up the wheels from you the other day. I cant wait to meet up with you either! We (well I for sure) will be at the Back to the Beach event! Bought 2016 Z06 this month. Had 7 miles on it. 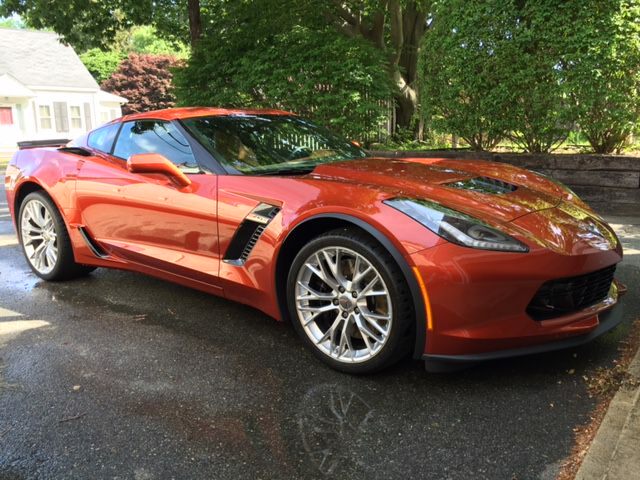 The color is Daytona Sunrise Orange Metallic, and the interior is Kalahari.